lvODE is a set wrappers, an interface to ODE (Open Dynamics Engine) library written in C and used to simulate dynamics of rigid body systems, including interactivity and in real time. 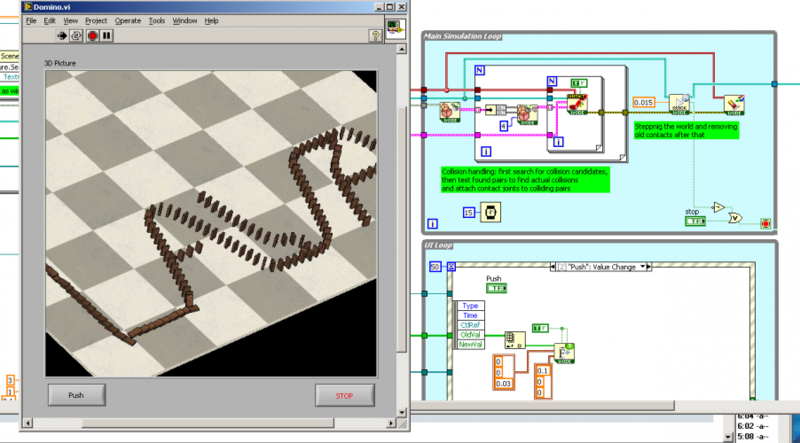 In the present state lvODE allows you to use almost the full functionality of ODE in the LabVIEW environment using object-oriented programming (LVOOP). Such simulations may be used, among others, for programming the control systems of robots and manipulators (as well as in the control systems themselves, i.e. for trajectory planning), for development and testing of artificial intelligence systems, for modeling of complex mechanisms and other physical systems, etc. lvODE is not a strict set of ODE wrappers. Although it uses the same concepts, the same terminology and most of the ODE functions are reflected, many of them have been grouped, data structures have been simplified, all in a user-friendly manner and taking into account specifics of LabVIEW environment. There are also few features not present in the original library which greatly facilitate programming – i.e. Object Manager. Further extensions (i.e. 3D Picture Control integration) are planned. Currently lvODE doesn’t cover all of ODE features. The major differences include: no support for trimesh, heighfield and convex geometries, the lack of a 2D Plane constraint, lack of gyroscopic mode for the bodies, single precision floating point numbers only. ODE is a free and widely-known library designed to simulate systems of rigid bodies. The programmer defines the layout of bodies, their physical parameters and types of connections between them, the role of the library is to calculate the forces acting in the system and to determine position and velocity of all bodies in the next time step, while satisfying all defined relationships. 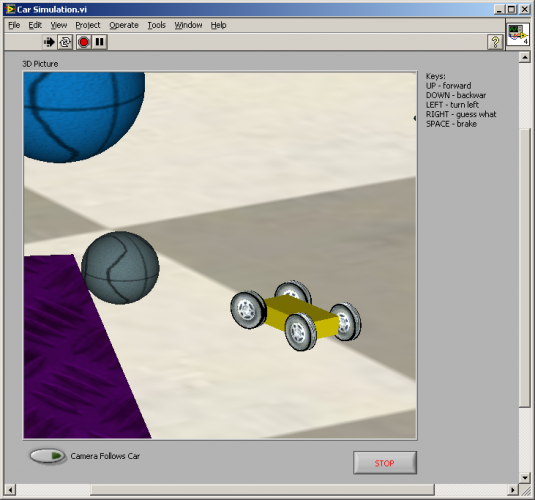 Programmer is able to interfere in simulation in full range while it goes on. It allows for the accurate analysis of its results (access to all the physical parameters) as well as programming any degree of interactivity. ODE is designed specifically to perform real time simulations – it uses a first order integrator (the procedure to solve a system of differential equations), which is a compromise between speed and accuracy. Results generated are not as accurate as they would be using higher-order integrators, but it is stable, fast and flexible. The contents of the archive folder ("lvODE") should be extracted to directory \user.lib. After restarting LabVIEW the sub-palette "lvODE" appears in the User Libraries section, where all the necessary functions may be found. Or use the VIPM package. ODE Manual.pdf - The original guide to the ODE. At least brief knowledge of it is necessary to understand the main concepts and mechanisms of library. Due to the use of the same terminology, it can also be a sufficient source to use the lvODE. The main difference from the original is the simplified naming convention. lvODE Class Hierarchy.pdf - graphical representation of a lvODE class hierarchy of classes library - not necessary to start programming, but it may help to understand certain concepts. An integral part of the documentation are also descriptions in of context help for each VI. In large part they fit the descriptions in the file "lvODE Function Reference". Private functions are documented as well. Example applications are located in "examples" subdirectory. There are few examples with varying degree of complexity, and with comprehensive comments in the code. These examples, supported by context help and (in difficult cases), reading a few chapters of the original manual should be sufficient to start programming in lvODE.